Much of volleyball lingo is about volleyball hitting terms. Here are some volleyball terms used for offense. You find a link into defensive terminology in the end of this page. Pipe: Set the pipe occurs when a back row player jumps and attacks a set from behind the attack line. Shoot: A shoot is a quick, low set to a hitter hitting outside. Slide: A slide is when an attacker, usually a middle hitter, fakes a quick approach and takes steps along the net chasing the ball that travels behind the setter. The attacker then jumps off one foot parallel to the net and hits the ball mid air. Three Ball or Thirty One: A Three is very much like a shoot except that the set goes only about half way to the outside. So, it is basically a shoot to the middle hitter. Thirty Two: This is a slower and higher thirty one set. This is set around 3 feet above the net - between the "quick one" and "thirty one". Off Speed Spike: This is a controlled spike ball placed in an open area of the court. Open Hand Tip: When an attacker directs the ball with the fingers to attack. Outside Shoot: An outside shoot is a quick set to the outside hitter. Volleyball Terms: "Hitting Outside Shoot?" 32: A 32 is a ball that is set between the outside and the middle. It goes further than "quick one" and is set around 3 feet above the net. This "thirty-two" is often used in Cross or Tandem plays (read below). Flare: This is when an attacker tries to trick the opponents by working with another teammate. While a teammate runs a quick fake the attacker takes an inside-out path to attack an outside set. Isolation Play: An attacker is used as a distraction to tie up opposing blockers while another teammate attacks against a single blocker. Tandem: When one player follows behind another player when going to attack. This causes confusion among the opponents because they have to choose which attacker to stay with. 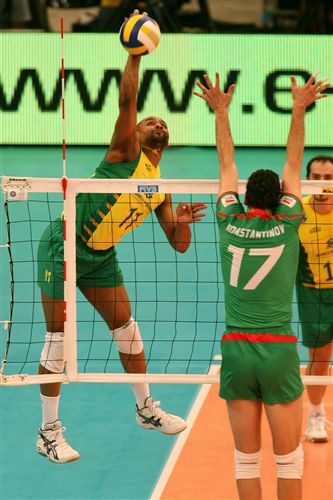 Volleyball Terms: "Hitting Tandem or Cross here?" Double quick: When two hitters approach to hit quick sets. 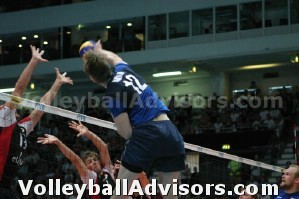 A middle hitter approaches to hit from the front and a right side hitter approaches to hit from the back. X Play: An X or sometimes called a "Cross" is when hitters approach to hit crossing each other's paths. Four-Two Offense: A 4-2 offense is the most basic volleyball offensive system in which there is a 6 player offensive system with four hitters and two setters. Five-One Offense: A 5-1 offense is a 6 player offensive system with one setter and five hitters. Six-Two Offense: A 6-2 is a 6 player offensive system that uses two setters and six hitters. Cross Court Shot: An attack directed across the net at an angle from one side of the court to the other. 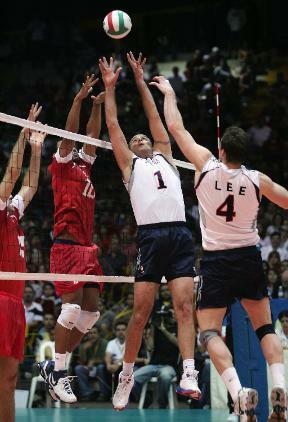 Volleyball Terms: "Line Shot coming up?" Line Shot: Attacking the ball down the opponent's sideline. Cut Shot: This is a spike that is hit at a very sharp angle from the hitter's strong side. Dink: When a player attacks the ball by tapping it with their fingertips. It is a tricky shot that is useful for faking out the opponents. Power Tip: When a player attacks the ball by pushing the ball with their fingertips. But the attacker must be careful that they do not touch the ball for too long. Check the link below for Volleyball Defense Terms. Common Defensive Terms in Volleyball. What is an offside block? Flipper? Gator?